In the past week, millions of Muslims have flocked to Mecca in Saudi Arabia for the hajj, which takes place each year between the 8th and 12th days of Dhul Hijjah, the last month of the Islamic lunar calendar. The pilgrimage draws over 2.5 million believers. Mecca is the center of the Muslim worldview and the hajj is not only a physical journey but a spiritual one as well. Pilgrims leave behind all their worldly markers, signified by the ihram, two white sheets worn by all men, and spend four days worshiping God. While the hajj is the fifth pillar in Islam and is required for all able-bodied Muslims once in their life, its origins stem from pre-Islamic Arabian practices. Even before the emergence of Islam, people would come and perform pilgrimage in the city of Mecca. Moreover, many of the rituals of the hajj as it is known now come from the story of Abraham and his son Ishmael. For example, during the hajj, pilgrims run between Safa and Marwa, two hills now enclosed in Masjid Al-Haram, the mosque that surrounds the Kaaba, to emulate Hagar’s search for water for her son Ishmael. Another example is the rite of the jamarat, where pilgrims throw stones at three pillars that represent the places that Satan tried to tempt Abraham to desist from sacrificing his son. One rite that does not have Abrahamic origins but is very important is the standing at the Plain of Arafat. Standing at Arafat is the most important rite of the pilgrimage and occurs on the second day, this year on November 5th. Pilgrims spend the day praying, reading from the Qur’an, and contemplating their lives. Some pilgrims will stand on a hill called Jabal Ar-Rahmah (the Mount of Mercy) at the Plain where Prophet Muhammad gave his final sermon. The days leading up to and during the hajj are sacred for all Muslims whether or not they are performing the pilgrimage. After the rite of the jamarat, pilgrims and Muslims around the world will sacrifice an animal and the meat will be distributed to the less fortunate. This also stems from the Abrahamic story, when God sent down a ram in the place of Abraham’s son. On that day, Muslims who are not performing the hajj celebrate Eid Al-Adha (the celebration of the sacrifice), the second of the Islamic holidays. Even though the pilgrimage is supposed to be a peaceful event, that has not always been the case. Political and religious issues have sometimes resulted in violence. Moreover, there have been incidents where large numbers of pilgrims have been killed as a result of the overcrowding. Saudi Arabia has spent millions to alleviate some of the logistical problems and to improve the experience of hajj, from building a muti-level bridge at the jamarat to a high speed train to move pilgrims safely and quickly from one point to another. Despite the obstacles of hajj, the experience changes the pilgrim. The most famous example is Malcolm X, who expressed his sentiments in a letter to his wife. Not all pilgrims record their experience as Malcolm X did, but all maintain that they came back transformed. The hajj is the culmination of a person’s practice of Islam because one travels to the center of the Muslim worldview, leaves behind worldly connections, emulates the prophets and their struggles, and worships God. Have you performed the hajj? What was your experience? Do other faith traditions have pilgrimages? What role does pilgrimage play a believer’s experience of their faith? 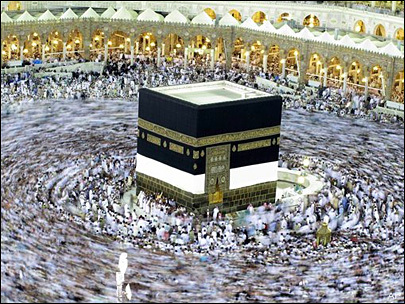 Do you think the Arab Spring will impact the hajj this year? Please leave your comments below. This entry was posted in The Hajj and tagged #Abrahamic Faiths, #SSRCWCG, Abraham, Arab Spring, hajj, Ishmael, Kaaba, Malcolm X, Plain of Arafat by Reem. Bookmark the permalink.